When you are 1/100 to win a tennis match, it’s going to take something special from your opponent to cause an upset. Neither Thomas Schoorel nor Karol Beck could conjure up any sort of magic to upset the favourites for the Qatar Exxon Mobil Open, and Rafael Nadal and Roger Federer can also ease past their second round opponents. Marco Chiudinelli, Federer’s compatriot, is next up for the world number two and Federer is 1/50 to ease past his opponent when their match gets under way at 2.00pm. Those punters looking for a little better value can back Federer at 1/10 to win in straight sets. Rafael Nadal faces Slovakian Lukas Lacko and is the same price as he was yesterday to beat Beck, 1/100. Lacko should prove no problem for Nadal and the Spaniard is 1/12 to win in straight sets, but once again, punters will need to look away from the world’s top two to find some value. 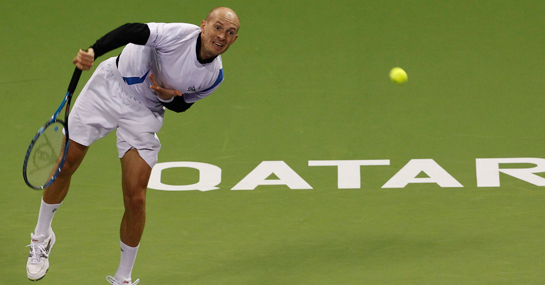 Nikolay Davydenko is thid favourite at 8/1 in the Qatar Exxon Mobil Open winners betting market, but the Russian faces a tricky tie aganst Jarkko Nieminen in the pick of the secound round ties. The two have met four times previously – although they haven’t met since 2007 – and have two wins apiece. Davydenko has been on the slide down the rankings and will be hoping for a much better year in 2011 than he did in 2010, but the 1/3 for him to beat Nieminen offers little value. Niemenen, ranked 39 in the world, offers punters plenty of value at 9/4 and can make sure Davydenko’s year starts as badly as his last year finished. A tight match should be expected and Nieminen is 9/2 to win the tie by two sets to one, and is a huge price at 9/1 to lose the first set but win the match. A £10 stake on Nieminem winning 2-1 would return £55. New customers can sign up here for a free £10 bet.